Curl Vs. Smooth: How are you going to deal with your summertime hair challenges? You wake up in the morning, shower, blow dry your hair, maybe straighten it if you have wavy or curly hair and then you step outside. Within minutes your smooth, styled hair has become a wild, frizzy mess. If you’re like most women with this problem, you wear a lot of ponytails in the summer just so you don’t have to deal with this fight over frizz. So what causes frizz? Frizz is most commonly found on people with curly or processed hair. These hair types are in dire need of moisture, and because of this, each hair strand has holes in it, like potholes in the road. The more holes, the more the hair is prone to frizz. In the summer, the humidity level is high, causing curly, processed hair to grab at the moisture like crazy to fill its holes. If you want to eliminate or soften your curls this summer, a keratin treat-ment is an excellent option. Your hair is made of keratin, so when a keratin treat-ment is applied to your hair, it fills in those “potholes” caused by dehydration. In the past there were just a few keratin treatments available to consumers. One of the most popular treatments contained formaldehyde, which was causing major health problems for stylists after inhaling the fumes. Now, there is a new treatment available that is safe for you and your stylist, and will reduce your frizz by 90%! It’s called Keratherapy™ and at Fusion we offer five levels of a keratin treat-ment. Whether you have a weekend getaway coming up and you just don’t feel like fussing with your hair; you’re planning on going from dark to light; or you simply want to be frizz free for six weeks, we can customize a keratin treatment just for you. But what if you love your curls, and don’t want to reduce or smooth them out? We have the system for you. The Deva system is like a keratin treatment in that it conditions the hair, but unlike a keratin treatment, it is weightless and keeps your curls intact, bouncing, and protected from frizz! We are certified by Deva system not only to protect your spirals, but also to cut curly hair. 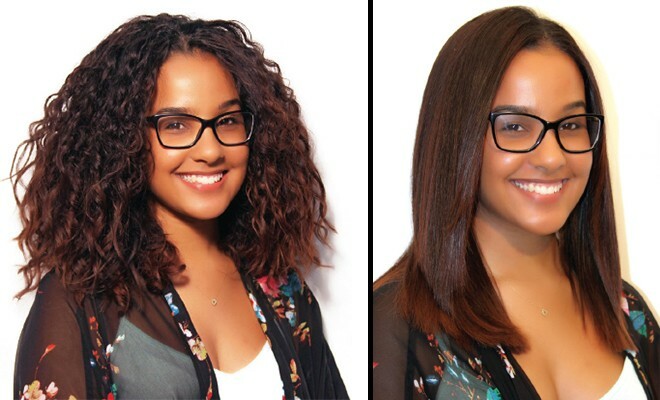 During your appointment, your certified stylist will educate you on how to take care of your curls outside of the salon. For opti-mum results we ask our clients to arrive to their appointment with clean, dry hair: no product, ponytails, or clips of any kind. The Deva system is like a skincare routine, if it’s not done properly you will not get the results you want. To keep your hair resilient to summer’s humidity we have two summer specials for our Women’s Journal readers! BE SENSATIONAL. BE CONFIDENT. BE YOU.